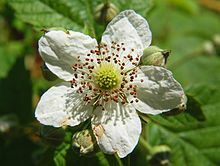 Rubus is a genus of shrubs; stems biennial and usually prickly. First year stems (primocanes) are unbranched and do not flower. Second year stems (floricanes) develop branches which flower. Leaves mostly palmately compound, those of primocanes are compound those of floricanes are often mixed, with both simple and compound leaves, margins usually toothed or lobed. Rubus sp.flower bud. 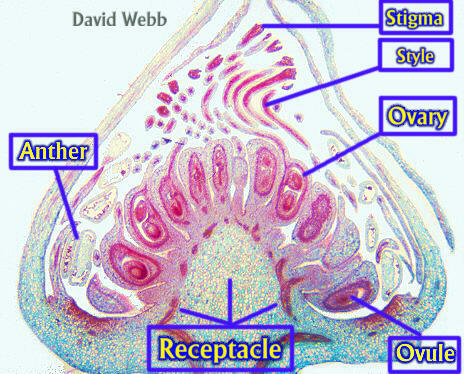 (microscopic section) David Webb.www.biologie.uni-hamburg.de. (Accessed 9/2014). Flowers most often white, sepals and petals 5, stamens and pistils numerous arising from a fleshy receptacle (base of the flower) that often elongates as fruit develops. Fruit usually red becoming black, or red at maturity, consisting of a cluster of small, fleshy, 1-seeded fruitlets (drupelets) that fall off the plant together with or without the receptacle. Habitat: Mostly plants of disturbed areas or bright edges.